Summary: The Sea Turtle Preservation Society (STPS) wants to strengthen and improve its public education through outreach to area boaters and fisherman. STPS will design, print and distribute 20,000 moisture resistant UV coated 4 x 9 inch ?rack? 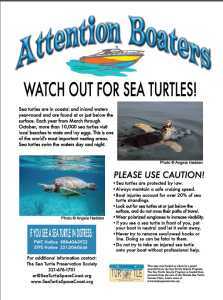 card advising boaters about the hazards sea turtles face from boating interactions. The need was highlighted in the last 2 years with the ?Super Boat International? races that are held in the Cocoa Beach and Port Canaveral area in May. This education will help reduce the occurrences of boat / propeller injuries on sea turtles. Results: The boater information card was printed for less than anticipated so a request was made to use remaining funds to produce durable speed limit size signs with the same information to be placed at countywide boat ramps. Matt Culver , Boating & Waterways Program Coordinator at Brevard County Natural Resources, assisted in putting the signs up and placing a larger 2 sided sign near a boat ramp and recreation area at Ballard Park located on the Indian River Lagoon in Melbourne, Florida. Several signs were given to the Port Canaveral Public works to place at the Ports public ramps. The signs and cards have helped boaters watch for the sea turtles at the surface. As in May 2012, volunteers will hand out the cards to boaters at the 2013 Cocoa Beach Super Boat Race to increase awareness.